Beijing is furious that US First Lady Michelle Obama declined to travel out to Rancho Mirage to meet her Chinese counterpart, according to the NY-based Chinese-language site DW News. The article claims that China First Lady Peng Liyuan — who happens to be a PLA major general famous for her inspiring rendition of patriotic songs — had wanted to meet Mrs Obama during her visit with Xi to the Sunnylands retreat in Rancho Mirage, a desert resort near Palm Springs. Michelle Obama is reported to have declined the opportunity in order to be with her two daughters in Washington DC during their final week of school, according to the report. Both Peng and Beijing are said to have seen the US First Lady’s sending of regrets as a deliberate slight calculated to embarrass the Chinese government. 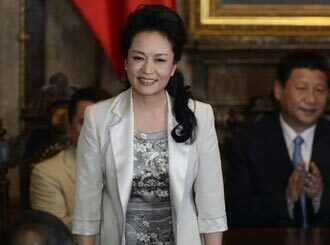 As one of China’s most glamorous personalities, Peng often commands more human interest among Chinese than her husband. More Chinese were no doubt took more interest in seeing her shine in the media spotlight during the two-day US visit than in seeing the more routine interaction between her husband and President Obama. To their disappointment Peng’s only US public event appears to have been a special VIP tour of the Palm Springs Art Museum which had extended its hours for the occasion. Peng was personally escorted by California First Lady Anne Gust Brown, wife of governor Jerry Brown, but the occasion was a far cry from a luncheon with the US First Lady. The intense disappointment at the lack of opportunities for the most glamorous first lady in China’s modern history to bask in the media spotlight during a high-profile event may have prompted some of the overwrought speculation as to the offense presumed to have been taken by Beijing. Even if Beijing’s top leadership and Peng herself weren’t miffed by Michelle’s Obama’s refusal to fly out to Rancho Mirage, the Chinese people were certainly upset. Aside from her desire to be at home for her daughters’ final week of school — which often features events parents are expected to attend — Michelle Obama may have had good reason not to join her husband at Rancho Mirage. For one, Xi’s visit to the US followed visits to Russia, Tanzania, South Africa, the Republic of Congo, the Carribean and Mexico. Emphasizing the the not-so-subtle message that the US isn’t a top diplomatic priority, Xi’s stay in Mexico lasted three days compared with just two in the US. For another, Peng’s current status as a PLA major general would make a one-on-one meeting with Michelle Obama awkward, if not a downright violation of diplomatic and military protocols between two non-allied nation. The speculation over the missed opportunity to cement ties on a human level between the Obamas and the Xis wasn’t confined to the Chinese side. The US diplomatic journal Foreign Policy published two essays on its website concerning the issue. One deemed Michelle Obama’s decision not to meet Mrs Xi a “diplomatic misstep”. The other argued that a meeting was properly declined because, “Peng spent her career belting out Chinese propaganda” with which Americans don’t want to be associated. The real reason behind the non-meeting of the world’s two leading first ladies is probably the product of mixed motives. The desire on Michelle Obama’s part to be with her daughters during an important time in their lives is certainly a big factor, as any parent can attest. The other was likely the result of a consensus by her husband and their advisors that relations between Washington and Beijing need to reach a new level before a meeting between their first ladies is accorded top priority. China's glamorous and independently famous First Lady Peng Liyuan often commands more intense human interest among Chinese than her husband Xi Jinping.